Flats and diaper covers are considered a more traditional cloth diapering option compared to modern cloth diapers like pockets and all in ones. Flats are also among the most economical cloth diapering methods. They're easy to use, easy to launder, inexpensive and very forgiving. 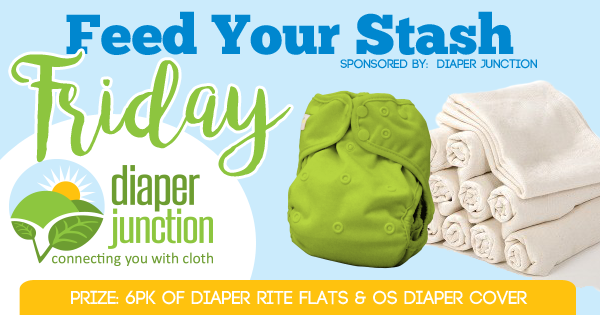 If you've been interested in trying Flats & Diaper Covers then you should enter to win via this great giveaway. One lucky Diaper Junction fan will receive a 6pk of Diaper Rite Birdseye Flats and OS Diaper Rite Diaper Cover of their choice from our in stock selection! To enter to win use the Rafflecopter form below. This contest is open to the USA & Canada. You must be 18 years or older to enter to win. Winners will be notified by email and will have 7 days to reply and claim their prize. I have yet to try flats but I do love DJ's covers! A week ago I Bought 12 large diaper rite brand flats and 6 small. They have been great. Everytime I wash them they become more absorbent. I decided to go with flats because they are easy to care and I just love them. I want to tried they cotton or bambo prefolds. I haven't tried diaper rite diapers out yet, but, they sound amazing and great quality!